Once-green lawns are withered to parched brown patches, some turned over to gravel. Long hot showers are a thing of the past, replaced by buckets. Unwashed clothes pile up while used, leftover cooking water is collected to be poured into toilets and to water browning trees. Sound like a dystopian sci-fi flick? It’s happening now in rural towns in California’s Central Valley, one of world’s most productive agricultural regions, as the state moves into the fifth year of an unprecedented drought. Residents across the state have been cutting back since an April 2015 mandate ordering a 25% slash in water usage. For thousands in the Central Valley, however, where thirsty crops guzzle with abandon, the local wells that residents depend on have run dry, and bottled water is more precious than champagne. These are the small towns, their main streets and dirt roads touched by dust and poverty, that are populated by the workers who do agriculture’s literal heavy lifting, picking and packing the fresh produce that brightens our tables. California has endured droughts before, but this one is different. It isn’t expected to end anytime soon. Even recent heavy rains aren’t nearly enough after the long, dry years; instead, rains trigger floods and landslides on the barren landscape. More alarming—the problem is much, much larger than California. On March 22, 2015, World Water Day, the United Nations issued a global report, warning that if we all continue on as is, we’ll have only 60% of the water we need in 2030. That’s just 14 years away, less time than it takes to age a good balsamic vinegar. Already, approximately three-fourths of a billion people lack access to safe drinking water, according to the United Nations. Miles of countryside in the Middle East are now desert due to a water shortage, points out British daily newspaper The Guardian, quoting crown prince General Sheikh Mohammed bin Zayed Al Nahyan of the United Arab Emirates: “For us, water is [now] more important than oil.” Across the globe, numerous areas are in crisis as reservoirs and aquifers (natural underground reservoirs) are over-pumped. In California’s Central Valley, the land is actually sinking from this pumping, more than a foot a year in places, according to CBS News, with repairs to infrastructure costing billions of dollars and no clear end in sight. What’s going on? A great deal, explains the U.N. report, including unchecked population growth in developing countries coupled with increased urbanization and industrialization. Worse, over recent decades, the rate of water demanded by the burgeoning global population has been double the rate of its growth. The pollution caused by the resulting expansion of agriculture, industrial production, mining, urban runoff, and wastewater continues to degrade the water supply. Moreover, climate change is increasing evaporation from open water sources and sparking unpredictable precipitation patterns. In California, the Sierra Nevada snowpack, normally the steadily melting source of 75% of the state’s water, is a meager 6% of its normal level, its lowest level in recorded history, according to National Geographic. Consequently, the state has relied more and more heavily on dwindling groundwater sources. It’s a big, big problem on so many levels. One that requires big solutions. Meagan Mauter has devoted her career to this calling, a broad and complex area to which she believes her broad interests and skills are best suited. Seated in her Carnegie Mellon University office, at the tail end of a long, labyrinthine hallway, the petite scientist enthusiastically explains her work. Dark brown ponytail swinging, the engineer spins from her computer to the span of whiteboards stretching across the wall. Equations, outlines, and more fill the space. Not surprising, given the earnest energy she exudes. “The water problem, at its core, is an interdisciplinary problem,” she declares. Indeed, the woman who majored in both civil engineering and history as an undergrad found CMU to be an ideal place to work, given its interdisciplinary prominence in the arts, business, computer science, engineering, the humanities, public policy, and science. It’s a place where she says one can stretch both the left and right brain in search of solutions to pressing problems. After earning a PhD in chemical and environmental engineering and completing a policy-oriented fellowship, she came to the Pittsburgh university in 2012, as an assistant professor in the Department of Civil and Environmental Engineering and Engineering and Public Policy (EPP). She holds courtesy appointments in chemical engineering and materials science & engineering as well. Mauter rolls over to the far right whiteboard, pointing to a list scrawled from top to bottom. 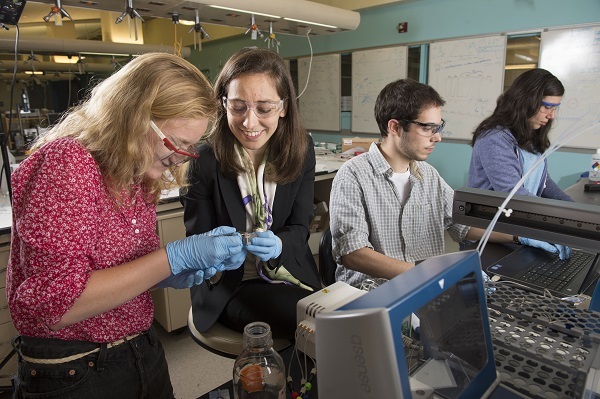 It’s the students who are working in her lab, 11 and counting at this point, from undergraduate to PhD, spanning all four of her engineering disciplines. As if on cue, a young man pokes his head around the corner mid-sentence. “Let’s talk after my 4 PM call,” she says. As an engineer, she has devoted herself to the water-supply side of the equation, to water treatment. She focuses on the energy component, as water and energy are inextricably tied; energy is needed to move and treat water just as water is needed to produce energy. Scarcity of one could trigger shortages and skyrocketing costs in the other, warns The New York Times. And there are environmental impacts. More energy used can mean increased emissions. Mauter’s work has shown, for example, that air emissions from the energy to treat coal-fired power plant wastewater can significantly exceed the benefits of the improved water quality. Other initiatives like the World Bank’s ThirstyEnergy are also working to increase awareness of this water-energy interdependence and the challenges it brings, along with promoting dialogue between government, international organizations, and the private sector. The bulk of her work involves water desalination, or removing salts and other minerals from saline water, because it's the most energy intensive. She believes it’s critical to approach the problem holistically—from top to bottom—and her team works at all levels. At the top, they look at the big picture, analyzing current policies and identifying water-treatment needs, whether in the agricultural, shale gas extraction, or electricity generation sectors. One project, for example, helps companies understand how to maximize their water re-use in Marcellus shale fracking, minimizing the need for freshwater withdrawal, wastewater trucking, or deep-well injection—where excessive rates of water pumping can lead to earthquake activity. Another project examines the feasibility of water desalination for agriculture, particularly in California’s Central Valley, where increasing soil salinity is a growing problem, and wastewater pours (along with polluting nitrates and more) into canals and on into the Sacramento–San Joaquin Bay Delta. Another project assesses the potential use of waste heat from coal-fired power plants for desalination. Her team has already demonstrated constraints to this process, for, contrary to the view of many, waste heat isn’t everywhere, and it’s not unlimited or free. These big-picture studies allow the team to determine where improvements—and their innovations—are most needed. “A systems-level knowledge can really identify what critical next steps are needed in technological development, can really direct and isolate the most important problems to tackle on the materials side,” Mauter explains. In this realm, she’s working to develop technologies and materials across the spectrum because, as she points out, you need a suite of different technologies available for the numerous real-life contexts. Her group is particularly focused on two ends of that spectrum: treatment of high-salinity oil and gas wastewater and the low-salinity water found in agricultural settings, both energy inefficient. Given what they’ve learned, exactly how can those Central Valley tomato and nut farmers efficiently access usable water? Perhaps a desalination facility to treat the water draining off their fields, like one that just came online in San Diego. It employs a process called reverse osmosis, essentially pushing seawater through filtering membranes, disposing of about half of what’s leftover. Shouldn’t lower-saline agricultural water be simpler to treat? And ideally, you’d want to treat selectively, removing certain salts but leaving those that can benefit your crops. Consequently, Mauter is in the process of developing electro-chemical methods that can address these issues, collaborating with Materials Science & Engineering and EPP Professor Jay Whitacre, who previously commercialized a revolutionary, non-toxic saltwater battery. Reverse osmosis also doesn’t work for the extremely saline wastewater produced during hydraulic fracking, a process in which a water mixture is injected into the earth at high pressure, fracturing shale rocks to release natural gas inside. For that situation, the team is collaborating with Civil and Environmental Engineering Professor Greg Lowry on a more efficient and affordable technique called membrane distillation, using new high-porosity membranes. And then there’s the group’s advanced membrane research, developing materials that can reduce membrane fouling and energy consumption. And there is more—all tackled by her lab of dedicated researchers. In a familiar scene that plays out weekly, Mauter stands at the door of a conference room in Doherty Hall, ready to begin her weekly group meeting. “Come on, it’s 9 AM; let’s go,” she prods the stragglers, as Kamakshi Sharma dashes through the door, breathless. A few others race in behind her. Sharma is one of the few undergraduate members of the largely graduate student team, an exciting yet intimidating proposition. She takes a seat at the table, and presentations begin. Each project group takes a turn, allowing the members to both learn and teach, sharing information and ideas. Sharma always finds it fascinating how Mauter “weaves it all together through our interest in water.” A civil and environmental engineering student, Sharma laughs with the policy-focused grad student she’s been working with, as another lab member launches into an incredibly dense technical topic. They’ll get their turn to dazzle them with policy soon. Sharma’s work in the lab was a fitting segue into the professional world she entered after her early graduation last year, joining her family’s water-treatment firm, Aquatech. The company works to solve its customers’ array of water issues while maintaining an environmental focus, its website populated with phrases that include “solving the world’s water-scarcity challenges,” “cutting-edge sustainable solutions,” and “minimize carbon and water footprint.” With her 1987 CMU alumnus father, Venkee, at the helm as CEO and her 1997 alumnus uncle Devesh as Managing Director, Aquatech represents multigenerational CMU community members committed to aiding in the water crisis. As the company helps its clients treat, reuse, and recycle water, it helps reduce demand on the strained global water supply so starkly predicted by the United Nations. During his undergraduate years in the School of Engineering, Venkee Sharma was studying “chemical and biomedical engineering by day and working in the engineering office and manufacturing facility by night” to learn the water-treatment business his own father had started 5 years prior. Soon after Venkee’s graduation, the senior Sharma passed away unexpectedly. At 24-years-old, Venkee had to step up and lead the company with his mother, Chandra. Through what he describes as trial by fire, he built the young business into what it is today with his brother Devesh following a similar path, a firm with more than 500 employees and projects in 60 countries, serving industries from oil and gas to power generation to municipal desalination. Kamakshi Sharma, now in the technology-development department of QUA, Aquatech’s advanced membrane business, has a unique angle on the impending crisis. Last year, for example, the company unveiled a technology to reduce power consumption and membrane fouling in desalination. Dubbed LoWatt because it reduces energy needs by as much as 30%, it saves customers money and reduces emissions as well as dependence on freshwater sources. The company recently made an industry splash, winning a large contract to use this technology for a desalination plant in the Middle East for 15 million imperial gallons a day of potable water, an area keenly aware of its water shortage. Aquatech also works with its clients to ensure effective wastewater treatment and recycle and reuse so that dependence on freshwater sources can be reduced. The company focuses on solutions that arrive at energy neutrality and reduced treatment costs through resource and energy recovery. In addition to being very active in providing desalination and wastewater treatment solutions, Aquatech is also a key leader in the industrial minimal and zero liquid discharge (MLD/ZLD) market. The company strives to offer a variety of advanced solutions to help clients comply with environmental requirements to ensure as little environmental impact as possible due to industrial activities. The company maintains a close collaboration with CMU, to the benefit of both, as Aquatech stays current on cutting-edge research for use in the field while the university stays aware of the most relevant and pressing industry needs. While Mauter and the Sharmas work on the industry side, another CMU faculty member is concentrating on water and the individual. Viswanathan and his team recently unveiled the design of a new device that could revolutionize quality of life. Imagine a rural village, its main water source a small muddy lake. Picture a local villager drawing water, then dropping a sticklike device into her bucket. After a period of time in the sunlight, the bucket begins to bubble. Energy from the sun sparks an electrochemical reaction, producing hydrogen peroxide that eliminates organic impurities. When the water is sanitized, she removes the device. With a little more time in the sun, the unstable hydrogen peroxide decomposes, leaving clean, drinkable water that the villager carries home to her family. The concept behind this device isn’t imaginary, though its genesis is fantastic. Like so many revolutionary ideas, the process was discovered accidentally. While studying how to split water into hydrogen and oxygen, Viswanathan’s team found that with certain materials and in a small voltage window, water could be split into hydrogen peroxide and hydrogen. According to simple thermodynamics, that shouldn’t have happened. Hydrogen peroxide was exactly what they didn’t want—for a fuel cell. But, Viswanathan wondered, what about water? The group uncovered anecdotal evidence of other researchers, frustrated and confused by similar reactions, disposing of the hydrogen peroxide. Viswanathan’s team and their collaborators worked to do just the opposite, to create it reliably. “It was quite a surprising thing for us because thermodynamics will tell you that it’s not possible,” says Viswanathan. “When we found we could make hydrogen peroxide with 10% selectivity—that was when I said, ‘OK, this is real.’” His motivated team is now in the prototype stage, exploring spin-off potential. One of those “top students” making news is alumna Elin Warn Betanzo (A’98, S’99), a Michigan water engineer. The Detroit Free Press recently recounted how Betanzo, along with her childhood friend, pediatrician Mona Hanna-Attisha, were instrumental in bringing to light the poisonously high lead levels in Flint’s municipal water. Another “top student” is Adam Simpson, a senior chemical engineering major who, like Kamakshi Sharma, comes by his interest in water naturally, as his family owns and operates a Jamaican water treatment plant. As reported in The Tartan, CMU’s student newspaper, Simpson is working to develop a soil-embedded fabric impregnated with a bacteria biofilm, capable of purifying water of polluting nitrates. These are just a sampling of CMU community members—alumni, faculty, and students—diligently working to overcome technological challenges in pursuit of ensuring the world’s water supply. All of us are hoping they’ll hurry.